A comprehensive reference source on human action and reaction, and the thoughts, feelings, and physiological functions behind those actions. Presented alphabetically by title, articles probe both enduring and exciting new topics in physiological psychology, perception, personality, abnormal and clinical psychology, cognition and learning, social psychology, developmental psychology, language, and applied contexts. Written by leading scientists in these disciplines, every article has been peer-reviewed to establish clarity, accuracy, and comprehensiveness. 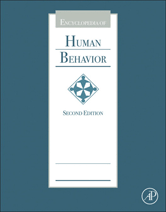 The first reference source to provide both depth and breadth to the study of human behavior, the encyclopedia promises to be a much used reference source. This set appeals to public, corporate, university and college libraries, libraries in two-year colleges and some secondary schools.